Posted by Victoria Bond to the School Guide Blog on 12 June 2013. It’s not every day we get our School Guide smalls in a twist. 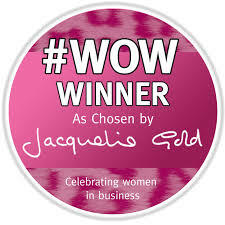 But when top entrepreneur and chief executive of Knickerbox and Anne Summers Jacqueline Gold announced our parent-friendly school information site had won one of her sought-after #WOW awards, we were all in a flutter. invited to join her exclusive #WOW club and even go forward to win #WOW of the year. The idea for a school information site for parents came about when I was searching for a school for my own son. I had to do a vast amount of homework on different school and education websites to get a full picture of each local primary. School Guide short cuts that process. Type any school in England in to the SEARCH BOX and it will return a school information page that includes up to eight fields of key data from exam results to Ofsted rating and teacher/pupil ratio. We put school website addresses and telephone numbers at parents’ fingertips too. I’m particularly proud of School Guide’s strong colour-coded design, which may well have caught Jacqueline Gold's eye. In fact, our primary schools are listed in hot pink league tables just like the #WOW badge sent to me from Jacqueline’s office. I do love an award but colour coordinated ones are especially welcome. I think the design is an essential part of our mission to help parents more easily understand school statistics. Percentages and results are often dressed-down in black and white spread sheets or plonked on a greyscale table. Our bright school pages *POP* with information and our dials whoosh on screen to high or low readings. School Guide has been a fantastic team effort including some incredible backend coding. The simplicity of the site belies its complex foundations. Adding 25,000+ schools each with specific geo locations, website addresses and multiple data points from three official sources has been a work of genius by our Head of Computer Science Tom and his Geek Prefect Dan. (Bit scared to mention our fantastically strict Chair of Governors Neil in case I spell something wrong and get sent to stand outside his office!) So I am of course accepting the badge on behalf of the boys in the office too. (Real men LOVE pink as my 9-year-old son told me when he asked if his new CROCs could be bubble gum pink this season.) It’s a huge boost, and has made us more determined to make school data as parent-friendly as it can be, especially as we are now working super hard to add Scottish, Welsh and Northern Irish data. We built School Guide for parents – all of whom should also get an award for just getting their little darlings to school every morning.